Aura by Thierry Mugler - A new oriental floral fragrance for women. This woody floral feminine scent created by Firmenich, includes notes of rhubarb leaf, tiger liana, orange blossom, bourbon vanilla, and wolfwood. 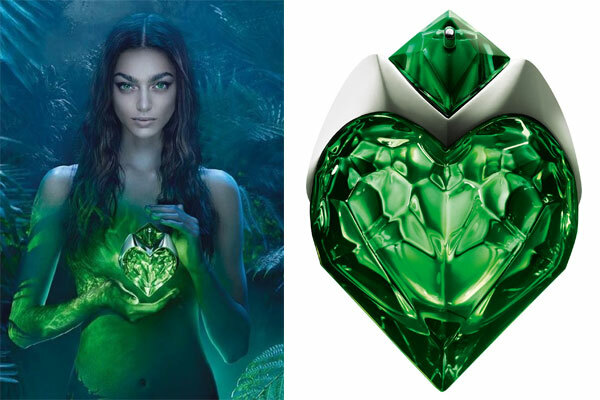 Launched in June 2017 the new Mugler scent is housed in a multifaceted emerald green heart shaped bottle topped with a metallic M. Available in an eau de parfum spray and matching body products. The perfume campaign ads feature model Zhenya Katava photographed by and Warren du Preez and Nick Thornton Jones. Package Design Emerald green faceted heart shaped bottle with metallic M.